If you had told me back in college that I’d one day be doing traditional food cooking demos, I’d probably have said you were crazy. I didn’t even know what traditional foods were back then! On the other hand, I did know a lot about late night 7-11 nachos, late night Denny’s breakfast specials and late night Taco Bell runs. That, of course, is one of the many reasons I’ve learned about traditional foods. When my health started crumbling in my late 20s, I went searching for answers. Thankfully, I found some in traditional foods. So now I teach clients about them and spend a lot of time in my Get At The Roots weight loss/wellness class extolling their virtues. I gotta say I’ve really been enjoying the new cooking demos for the class. At only the halfway point we’ve made whey, beet kvass, a carrot-beet salad, gluten free breads and muffins, bone stocks, kimchi and as you’ll see in the video below, sauerkraut. Fermented foods are one of the foundations of traditional foods. Sauerkraut is just fermented cabbage and it is one of the easiest fermented foods to make at home. In fact, its even become easier as I demonstrate the “no pound” method, a technique I tried for the first time. Typically, sauerkraut involves a bit of muscle work but with this method I was will NEVER have to spend additional time and energy pressing, pounding and pummeling my sauerkraut ever again! 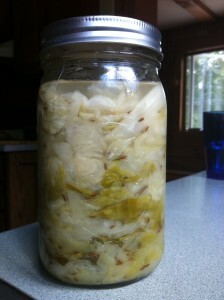 Fermentation is a way of preserving food. All traditional cultures, before the advent of refrigerators and freezers, consumed fermented foods on a regular basis. Fermented foods are alive with beneficial bacteria that are vital for our health, in particular, our digestive health. These beneficial bacteria are also known as “probiotics.” After all, “biotics” means “life” so probiotics means “pro-life.” We can’t live without them! Of course, we hear a lot about probiotics today and many people take probiotic supplements to help with a wide variety of digestive ailments. 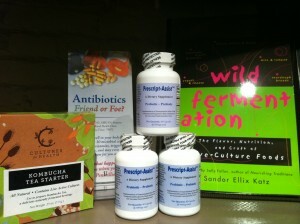 I use them in my practice but ultimately, we should be getting our probiotics from food. Sauerkraut, pickles, kimchi, pickled onions and beets are all common examples of fermented vegetables. Yogurt, cheese and kefir are common examples of fermented dairy products. You’ll find most of these things in your local health food stores. But learning how to ferment them yourself is not only fun but it can save you a lot of money in the long run. If you’d like to learn more about fermenting your own foods, check out one of my favorite sources, Wild Fermentation by Sandor Ellix Katz. Whether store bought or homemade, try to incorporate them in your diet on a regular basis. And if you’re new to fermented foods, especially vegetables, keep in mind that they can be a bit of an acquired (or as I like to say, ‘”re-acquired”) taste. Stick with it and I can almost guarantee you that you’ll be craving them on a regular basis. I know I sure do. I like to compare our inner microbial world to the Amazon rainforest. We know the rainforest is this incredibly diverse and fertile region of the earth and that it plays vital role in keeping our planet healthy. Similarly, we know our gut flora plays vital roles in our overall health. Science is still learning more about this complex microbial world that lives within us. In fact, it was recently featured in an article in the New York Times. Click here to check it out and learn more about our incredible inner ecosystem. And on that note, if you’re in western MA, all of my fermentation products including my probiotic of choice, Prescript Assist, are 10% off in the month of July. Stop in and check ’em out at Clinic Alternative Medicines, 98 Main St in downtown Northampton. And be sure to include some good ol’ fashioned sauerkraut on those hot dogs.